The side lying lateral raise is a great exercise for the shoulders. It is deceptively hard due to the angle so make sure to start with a lighter weight. Starting: Lie on your side on a flat surface. It can be on the floor, a bench or a mat. Maintain a stable spine and keep the top leg in front of the bottom leg to create a stable base. 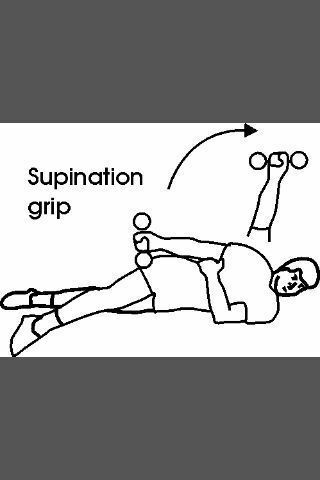 With a dumbbell in the top hand start with your arm at the hip and the thumb pointed up. Movement: make sure to lock your elbow in position and using the shoulder, raise your arm until your arm is pointing straight up towards the ceeling. Slowly lower the arm back to the hip. Lowering slowly will work opposing muscles and will create an even more intense workout.